Rick is a senior in high school and he is 18 years old. Rick has been riding since the age of two. He specializes in "team roping" and "calf roping." Rick has four horses that he rides and trains. His pride and joy is his horse "Money." He started team roping and calf roping during his freshman year in high school and has been participating in the SC High School Rodeo Association since that time. He is also a member of several professional rodeo associations. He will travel up to ten hours away to compete most weekends. Rick has won several of these professional rodeos and competed in the 25th Annual George Strait team roping competition in San Antonio, TX this March. 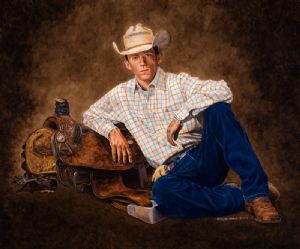 After graduation in May, he is planning to attend Northeast Texas Community College in Mount Pleasant, Texas where he will further his education and still be able to learn more about his true passion, rodeo riding. Rick is posed with his favorite saddle that his Dad bought for him. It's a high-end "Courts" roping saddle handmade by a company called "McMaster Custom Tack" in Texas. It is one gorgeous piece of work! The piece is traditional oils on the Ampersand "Gessobord" Masonite. The size is 24" x 20" overall. Description: This is a commission piece. My subject is a one of the most well-mannered kids I have ever met. His name is Rick Scruggs from Duncan, South Carolina. Duncan is near Spartanburg, where we lived before moving to Cody, Wyoming. This is traditional oils on Masonite. It is 24" x 20" overall. My reference photo was taken by Moore Photography in Duncan.